Air quality in the Central Valley of California and in particular the San Joaquin Valley is an issue of importance for the Almond Industry and Almond Alliance. Almond growers, hullers, shellers and processors comply with Federal, State, and local air agency regulations to do their part in addressing concerns with air emissions generated by almond production practices and have made significant improvements to their operations to reduce emissions. Almond Alliance stays engaged in existing and proposed new laws and regulations affecting the operations of our members and resources available through the association and our associate members to assist in complying with these laws and regulations. Two major climate bills passed the legislature in the last week and were signed by the Governor. The lead bill, SB 32 (Pavley) extends the state’s current greenhouse gas (GHG) program to 2030 and requires a target of 40% below 1990 levels with no oversight by the Legislature. The bill provides unfettered authority by the California Air Resources Board (CARB) to achieve the new GHG reduction goal. While carbon dioxide is the primary focus of California’s GHG program, methane emissions were also identified as major sources that need to be regulated to meet SB 32’s mandates; a major source of methane in California is our dairy and beef industries. In response to the move to regulate methane, representatives of the ag and livestock industry initiated negotiations on SB 1383 (Lara) to include restrictions and oversight on CARB as they begin regulating methane emissions from dairies and feedlots. SB 1383 limits California Air Resources Board (CARB) authority to regulate methane emissions from livestock manure management, requires the board to make findings that the regulations are cost effective, feasible and within existing economics of the industry. It also restricts CARB’s ability to regulate enteric emissions from livestock – which includes gas released from “both ends” of the cow. The long term viability of the dairy industry is important as a market for almond hulls. A new study by the University of California, Davis shows that almond trees accumulate and store significant amounts of carbon over the course of their 25-year life cycle, and the almond industry is making progress toward becoming carbon neutral or even carbon negative with respect to greenhouse gases (GHG). In addition to storing carbon, the industry’s efforts to reuse co-products from growing, harvesting and processing almonds are key to the industry’s environmental impact and further reducing carbon emissions. Funded in part by a grant from the Almond Board of California the study is the most exhaustive lifecycle assessment to date, examining many interrelated elements, from land preparation and planting the tree, through the life of the tree and eventual removal. The Almond Board is currently funding the second phase of the Life Cycle Assessment with UC Davis researchers, who will explore the energy use and greenhouse gas emissions beyond-the-farm production – including activities such as blanching, roasting, packaging and transporting almonds. AHPA assisted in gathering data for the hulling/shelling aspect of the study as well as various aspects of co-product usage. Co-product credits play an important role in estimating the life cycle environmental impacts attributable to almonds; the largest sources of credits are from orchard biomass and shells used in electricity generation. Findings from this life cycle analysis will play an integral role in telling our story to all audiences including consumers, legislators, and regulators. The California Air Resources Board (CARB) Truck & Bus regulations reduce diesel exhaust emissions from privately owned and federal government diesel trucks and buses. The amendments to the Truck and Bus regulation became effective on December 14, 2011. Below is a list of professionals that Almond Alliance has confirmed can come to your facility review you current permits, advise if additional permits are needed, process permit paperwork and negotiate with the Air District on your behalf. These professionals participate in the San Joaquin Valley Air Pollution Control Districts Certified Air Permitting Professionals Program (CAPP). One frequently asked question I receive is does my dryer need to be permitted by the air district? The answer is no, so long as your operation meets minimum criteria as detailed in the San Joaquin Valley Unified Pollution Control District (SJVAPCD) almond hulling permit processing guidelines. If your drying operation meets these criteria you are exempt from permit requirements. The complete almond hulling permit processing guidelines are available here. If you are receiving push back from the air district and drying can be done at the orchard level that may be an option worth pursuing. If you have specific questions or are receiving push back from an inspector please feel free to contact the Almond Alliance office. California air quality should get a boost from farmers using lower emission harvesting equipment, according to USDA’s Natural Resources Conservation Service in California. Beginning in 2016, the agency is offering a new incentive option for almond and walnut farmers (and potentially others) to use cleaner harvesting technology. According to Carlos Suarez, State Conservationist for NRCS in California, eligible farmers may receive an incentive of $10.52/acre for up to three years to adopt harvesters that have been certified through peer-review research to reduce particulate matter (PM) associated with harvest by at least 30 percent. The new low-emissions harvesting opportunity is funded through the NRCS Environmental Quality Incentives Program (EQIP). Information on the specific models of harvesters currently covered by the program can be obtained at the NRCS Service Centers. AHPA played an integral role working closely with NRCS, the Almond Board of California, and harvest equipment manufacturers to expand the program to nut growers. Eligible equipment is limited to specific harvesters certified through peer-reviewed demonstration trials at Texas A&M. Trials were supported by a USDA-NRCS Conservation Innovation Grant (CIG) and the San Joaquin Valley Air District, and builds on years of Almond Board-funded research on reducing dust emissions at harvest. The SJVAPCD announced that incentives for replacement of in-use, off-road tractors that are engaged in agricultural operations as defined by the California Air Resources Board. Eligible equipment includes but is not limited to wheel loaders, balers, combines, graders or tractors. Funding amounts are based on a dollar per horsepower table as determined by the horsepower of the engine in the new tractor, not to exceed 80% of the eligible costs. Applications are processed on a first come first served basis. A Click here to learn more about AHPA’s equipment discount program. The Carl Moyer Memorial Air Quality Standards Attainment Program (Carl Moyer Program) provides grant funding for cleaner-than-required engines and equipment. Grants are administered by local air districts. ARB works collaboratively with the districts and other stakeholders to set Guidelines and ensure the Program reduces pollution and provides cleaner air for Californians. The Carl Moyer Program achieves reductions in emissions of key pollutants which are necessary for California to meet its clean air commitments under regulatory requirements. Eligible projects include cleaner on-road, off-road, marine, locomotive, lawn & garden, light duty passenger vehicles being scrapped and agricultural equipment. Click here to learn more. For more information regarding the Carl Moyer Program, please email ARB or call ARB’s Diesel Hotline at 866-6DIESEL or (866) 634-3735. The Air Quality Improvement Program (AQIP), established by the California Alternative and Renewable Fuel, Vehicle Technology, Clean Air, and Carbon Reduction Act of 2007 (Assembly Bill (AB) 118, Statutes of 2007, Chapter 750), is a voluntary incentive program administered by the Air Resources Board (ARB or Board) to fund clean vehicle and equipment projects, research on biofuels production and the air quality impacts of alternative fuels, and workforce training. The AQIP Guidelines and annual Funding Plans guide ARB’s implementation of the AQIP. Project categories include: Hybrid Truck and Bus Voucher Incentive Project, Clean Vehicle Rebate Project, Lawn and Garden Equipment Replacement Project, Zero-Emission All-Terrain Agricultural Work Vehicle Rebate Project, Advanced Technology Demonstration Projects, and Hybrid Off-Road Equipment Pilot Project. 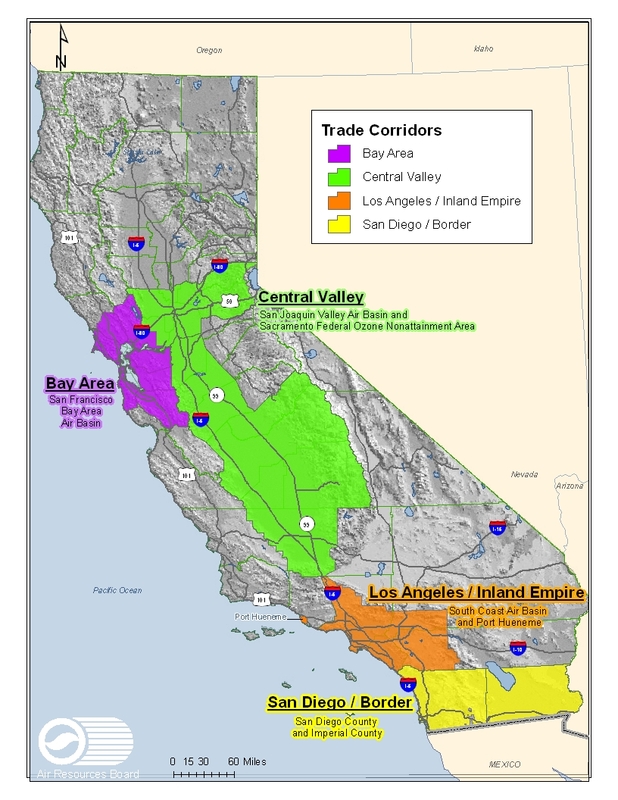 The $1 billion Proposition 1B: Goods Movement Emission Reduction Program (Program) is a partnership between the State Air Resources Board (ARB) and local agencies (like air districts and seaports) to quickly reduce air pollution emissions and health risk from freight movement along California’s trade corridors (map). Local agencies apply to ARB for funding, then those agencies offer financial incentives to owners of equipment used in freight movement to upgrade to cleaner technologies. Projects funded under this Program must achieve early or extra emission reductions not otherwise required by law or regulation. NRCS administers the Environmental Quality Incentives Program (EQIP) which is a voluntary program that provides financial and technical assistance to agricultural producers through contracts up to a maximum term of ten years in length. These contracts provide financial assistance to help plan and implement conservation practices that address natural resource concerns and for opportunities to improve soil, water, plant, animal, air and related resources on agricultural land and non-industrial private forestland. EQIP funds can be used to mitigate dust and to reduce emissions from agricultural engines; hundreds of tractors have been replaced in the San Joaquin Valley utilzing EQIP funds. Note if you are receiving funding from a state or local program you cannot obtain additional funding through EQIP. Since 2008, EPA has funded nearly 60,000 pieces of clean diesel technology through the National Clean Diesel Campaign. These technologies include emissions and idle control devices, aerodynamic equipment, engine and vehicle replacements, and alternative fuel options. The projects meet critical local air quality needs by deploying both proven and emerging technologies much earlier than would otherwise occur. In January 2010, President Obama signed legislation, H.R. 5809 (PDF) (6pp, 125K, January 2010, About PDF), reauthorizing DERA grants to eligible entities for projects that reduce emissions from existing diesel engines. The bill, passed by the Senate on December 16 and the House on December 21, authorizes up to $100 million annually for FY2012 through FY2016 and allows for new types of funding mechanisms. $29.9 million was appropriated by Congress for FY2012. AHPA was engaged in getting DERA funding reauthorized.